Wow ... did a BP representative really say that? Well, no. But a satirical Twitter feed, which at first glance looks like an official BP account, is serving up a scathing daily parody of the company's efforts to clean up the Gulf Coast oil spill. 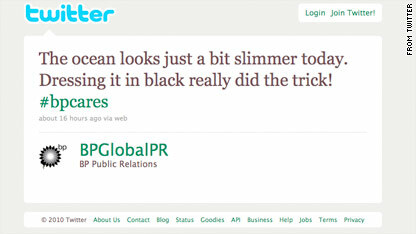 A quick read of @bpglobalpr, a Twitter account created last week, should reveal to most users that this is no BP-sanctioned public relations campaign. "Please help us with rebranding. We're not calling it an 'oil spill' anymore, now it's a 'Southern Fun Party' #bpcares," read a post from late Tuesday. "Funny, no one has thanked us for seasons 3-15 of Treme yet. #bpcares," read another, referencing the HBO series set in New Orleans during the aftermath of Hurricane Katrina. The feed definitely requires an appreciation of gallows humor. Written in the voice of a clueless oil-company spokesperson, it often makes light of the spill. From Monday: "The ocean looks just a bit slimmer today. Dressing it in black really did the trick! #bpcares." And from last week: "Please do NOT take or clean any oil you find on the beach. That is the property of British Petroleum and we WILL sue you." The feed's popularity is steadily climbing, with more than 38,000 followers as of Wedneday morning. By contrast, the actual BP America Twitter feed had about 5,600. Aside from tweaking the company whose offshore oil rig exploded, dumping millions of gallons of oil into the Gulf, there may be an altruistic motive behind the Twitter account. The feed repeatedly links to a site selling anti-BP T-shirts and claiming the proceeds will be donated to the Gulf Restoration Network, a group that works to protect and restore the Gulf region. Whoever is behind the Twitter account did not respond to a message requesting comment for this post. A spokesman for BP said the company is aware of the Twitter feed, saying that anyone who sees it almost surely will know it's a spoof. AOL, an early titan of the internet that now finds itself struggling to rebrand in a vastly bigger online world, turned 25 on Monday. In people years, 25 is young. On the internet, it makes you a wizened veteran. At a celebration at AOL's Dulles, Virginia, campus, chairman and CEO Tim Armstrong worked to turn a celebration of the seminal web portal's past into a look at its future. "Today's event is not just meant to honor that rich history, but celebrate the next 25 years of helping people through innovation and creativity," he said. "We're certainly proud of our past, but we're even more excited about what we have in store for customers as we move forward into the future." To be sure, AOL's customer base is smaller than it once was in the dial-up days. Known best for its pay e-mail service and "you've got mail!" 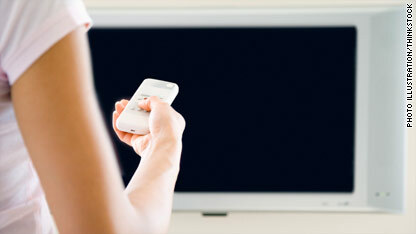 greeting, AOL has watched a peak of 26 million customers dwindle to about 6 million by the end of last year. Its instant messenger service remains viable, although it too has slipped as people move toward text messaging and direct messages on sites like Facebook and Twitter. 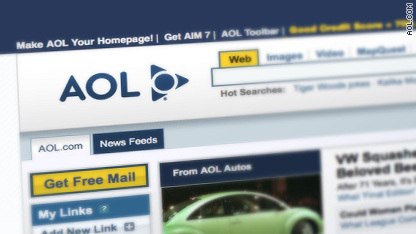 But AOL's homepage remains one of the internet's most visited, ranking consistently in the top five sites and drawing about 250 million unique visitors a month, according to web analyzers comScore. After a split late last year with CNN parent company TimeWarner (dissolving a deal that some analysts have called the worst corporate marriage in history) AOL rolled out a visual remake and a new strategy. Focusing on advertising, a blog network and quick-hit news, AOL is stepping into areas that may not even carry the familiar AOL logos (the blue triangle and yellow "running man" have largely disappeared and AOL is now technically "aol." - with the period). You may have beaten us to 1 million followers on Twitter, but that's so last year. 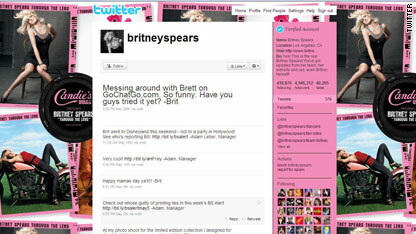 Now, Twitter is Britney's world. Over the weekend, the official Britney Spears Twitter account passed actor Ashton Kutcher's feed as the most popular on the microblogging site. Both are closing in on a whopping 5 million followers - Britney had about 4,946,000 as of late Monday morning, compared to Kutcher's 4,942,000. Her new place in the top spot comes despite the fact that Britney's feed, in contrast to Kutcher's ultra-personal musings, is largely filled by posts from her manager, Adam Leber, and other staffers. She does chime in from time to time, though, with posts like "Happy mamas day ya'll!! -Brit," on May 9. The most recent Britney post on Twitter - where many popular users are always updating their status - is from last Wednesday. There was no acknowledgement of the milestone on the feed. On Kutcher's Twitter feed , he addressed the seismic shift in the Twitterverse by dismissing it. He's been doing promotional interviews for his upcoming movie "Killers" and said that - behind "Are you having a baby?" - the most popular question from reporters has been about being passed by Britney. "Answer 'I don't care. Aren't u suppose 2B a movie reporter?' " he wrote Sunday night. Aside from the mind-boggling realization that Britney has at least 5 million fans, the most interesting aspect of the news may be what the numbers say about Twitter's growth - or at least the growth of its most popular users. Just over a year ago, Kutcher and CNN's breaking news account, @CNNbrk, were publicly racing to become the first Twitter account with 1 million followers (that CNN account now has just over 3 million). "With now more than 400 million users from around the world, who have varying cultures and ideals, using Facebook as a place to discuss and share things that are important to them, we sometimes find people discussing and posting about topics that others may find controversial, inaccurate, or offensive." He did, however, suggest Facebook is monitoring the situation closely. "When these feelings, or any content reported to us becomes an attack on anyone, including Muslim people, it will be removed and further action may be taken against the person responsible," he said. He said Facebook is disappointed with Pakistan's decision to block the site and is considering legal action. Pakistan's government issued an order Wednesday blocking Facebook for an indefinite time because the site had not removed the page. Seeking help for a charity or cause via social networking isn't new. But a current campaign to save the life of a 4-year-old boy has taken off in a big way, hoping to capitalize on crowdsourcing and social media to help him beat the odds. And according to a note on the group's website, there's a chance that it's already worked. 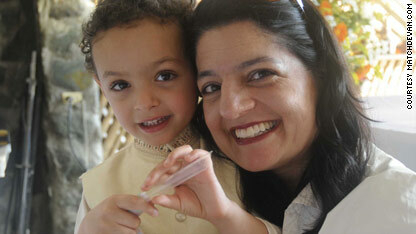 Devan Tatlow, whose family lives in Washington, D.C., has a rare form of leukemia and needs a bone marrow transplant. Complicating that is his mixed south Indian-northern European ancestry - which supporters say gives him a 1-in-200,000 chance of finding a match. Doctors say they have less than 12 weeks. Instead of trying to beat those odds the normal way, his family and their friends went online and turned their quest viral. Rob Kenny, Devan's godfather, said hundreds of people have taken active roles drumming up support in what has become a global effort. While Devan lives in Washington, Kenny is in the United Kingdom, the Facebook campaign is being run out of Hong Kong and active recruitment drives are happening in Mexico, Singapore and other places. Their message has been tweeted by the thousands on Twitter, and probably even more people have mentioned Devan's cause in their Facebook statuses. Their efforts have been promoted throughout the online community through posts on the Huffington Post, tech blog Gizmodo and other sites. The group is urging people to register at Be The Match, in hopes they'll be a match for Devan or someone else. On Tuesday came some good news: there's a chance their efforts have paid off. A message on the site's homepage said "a potential cord blood match" for Devan has been located. The group is awaiting confirmation that it truly is a match. Frustrated by Facebook's recent privacy changes, a group is urging users to delete their Facebook accounts en masse on May 31. 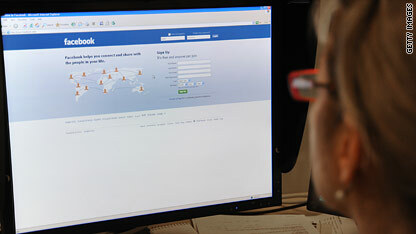 The campaign comes amid complaints that the social-networking juggernaut is diminishing users' privacy with its "open graph" model that adds Facebook connections on other sites across the internet. A handful of glitches during the rollout of the changes have, in fact, put some personal info at risk, if only briefly. It's clear that some folks are leaving the popular site. But the organized effort to get people to abandon their Facebook accounts doesn't appear to have gained much traction so far among the site's 400 million-plus users. More than 2,700 people had pledged to quit Facebook on the group's website Monday morning. 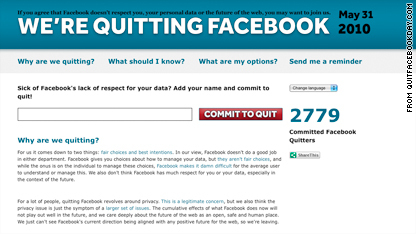 The Quit Facebook Day site asks, "Sick of Facebook's lack of respect for your data?" and calls on users to quit the site all at once on May 31. And about 1,090 people had "liked" the site's Quit Facebook Day page - which, ironically, is on Facebook - as of Monday morning. By contrast, more than seven times that many people are fans of former "Top Chef" contestant Kevin Gillespie's beard. A fairly random user-created page called "I Love Facebook" had roughly the same number of members as the "Quit Facebook" page. On Friday, the San Francisco Chronicle's Business Insider blog poked fun at the effort, albeit when the fledgling site had only a couple hundred people signed up. The post's title? "Uh-Oh, 0.00000068% Of Facebook Users Promise To Quit On May 31." Facebook doesn't provide the number of people who delete their accounts. But the overall numbers are clearly going the other way. A spokeswoman told CNN.com last week that Facebook had added 10 million active users since late April. 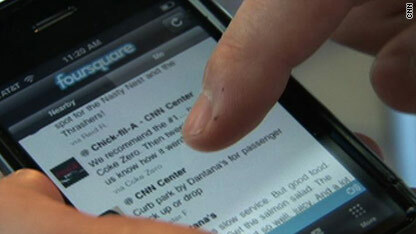 For anyone who's ever tried to check in somewhere on Foursquare, only to mutter, "No! That is NOT where I am," help is on the way. The makers of the burgeoning mobile game/social-networking tool said Tuesday that they've tweaked the way venues appear on their "Places" page. When a Foursquare user wants to check in at a location, they pull up the "Places" page and scroll down until they find the right spot. But sometimes the phone's GPS coordinates don't quite match reality, requiring the user to type in the name of their location to find it. "The problem with smartphones is that they’re good - but not great - at knowing exactly where you are," the folks at Team Foursquare wrote on their blog. " Also, there might be a lot of venues nearby that you are very unlikely to check into (like someone else’s apartment — which is great for them but not so much for you) that clutter up the list a little, and sometimes push the venue you want off the list altogether." The newly rejiggered algorithim now takes into account things like the popularity of a venue and work harder to pinpoint the ones closest to the user. A pretty cool tweak now considers what time of day the check-in is occurring. So, as the Foursquare folks write, at 8 a.m., a coffee shop would get priority on the list while, at 8 p.m., a restaurant or bar might move to the top. Foursquare promises more changes to come, making it quicker to check in then ... you know ... do whatever it was you went to that spot to do in the first place. The next version of Firefox will be a faster, more powerful Web experience, the browser's director says. In a presentation to Firefox developers, Mozilla's Mike Beltzner said that the planned version 3.7 of the browser will now become Firefox 4.0 - a revamp clearly designed to close ground on Microsoft's Internet Explorer and stay ahead of competitors like Google's upstart Chrome. "Usually software producers don’t present these sorts of plans in public until they’re finalized, but Mozilla is a little different," Beltzner wrote on his blog Monday. "We work in the open, socializing our plans early and often to gather feedback and build excitement in our worldwide community." In a presentation Beltzner posted on his Slideshare page, he said the new default theme for Firefox will be simpler, with fewer controls needed to navigate and fewer pixels on the page to improve the speed of searches. 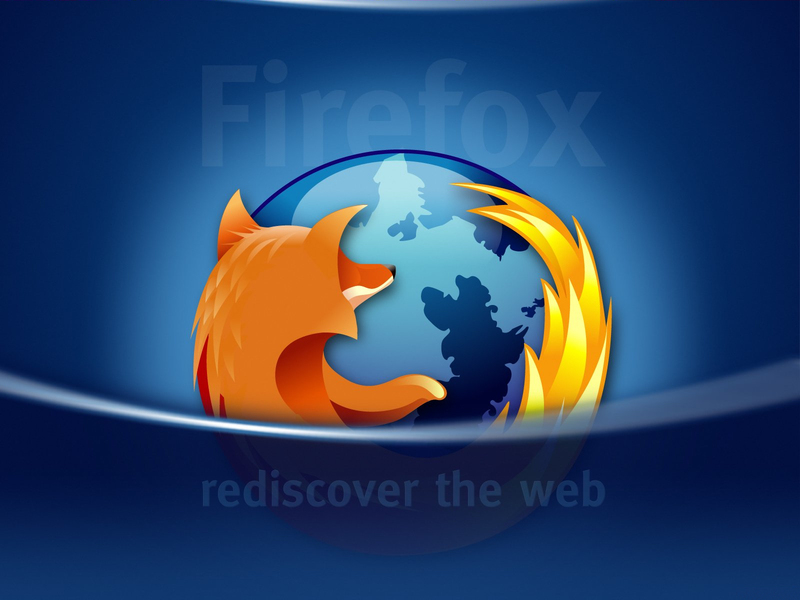 Firefox 4 also will let users store their passwords and settings for the websites they visit most, Beltzner said. It also will be possible to install add-ons - a popular developer activity on Mozilla's open-source browser - without having to restart. Version 4.0 also will be optimized for HTML5 - the emerging language expected to be used for most web coding in the future - and other new technologies. 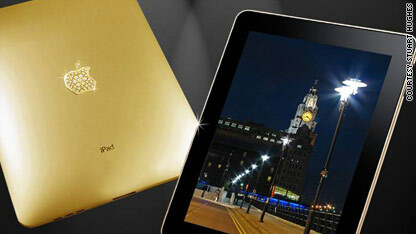 It will have more personalization and developer tools and tighter security settings, according to Beltzner. He said Mozilla plans to release Firefox 4.0 late this year - likely October or November - but stressed that the timeline is apt to change. "As with past releases, we use dates to set targets for milestones, and then we work together to track to those targets," he said in the blog. "We always judge each milestone release against our basic criteria of quality, performance, and usability, and we only ship when it’s ready."